For all your Fire Fan needs, whether you want to do technical fire fan routines, hand spinning or finger spinning. We have all you need. With out extensive range of lotus fire fans designs, 5 finger fire fan frame designs (say that ten times fast) you will not need to look any further. We even have kits if you are wanting to save some money get stuck in and stitch them up yourself. Kits and single fan frames are available for you now. Using Fire Fan is also a great way of meeting new people, by breaking down traditional barriers and creating interest to develop new friends and relationships. When you purchase from Home of Poi you also get hundreds of free video lessons to help you quickly impress yourself, and others, with your skills. "Thrilled with he look of these so much I bought a second pair." "Good amount of kevlar thread to do all 10 precut wicks. I recommend not doing them all in one go-kevlar is tough. Fingers will cramp, but it's well worth the discount to DIY!! Came with one curved needle. White paint is solid, not thin or patchy. Shows up well in dim light. Already dropped, no damage yet. Well weighted with the wicks on. Looking forward to performing with these lit. Poi skills translate straight into tech fans but a lot of the higher stuff doesn't because palm direction matters more than anything. The open handle is great for spins. The size is great, large enough to hold ALL THE FIRE, but not hit yourself too easily. So much fire... Thanks for the great fast shipping to NC, USA!" 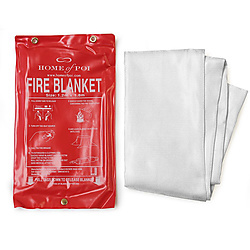 "If you're looking to get fire fans, but not sure what to get - sew your own wicks kit is the most economical option. Sure they are not as sturdy as other, much more expensive fans, but for their price you can buy a kit every 18-20 month (this is about how long the wicks lasted, also frame gets bent and chipped)"
Easy to make. Fun to spin! "Easy to assemble. Fun to make your own fans. Burns well. Love it!" "Tout est de qualit ... J'adore!" "Love these fans! Only one problem :/ one of the fans was missing a rivet point on one side of one of the stems and it broke away from the main ring. Still usable and i plan to fix them however i can! Can t wait to wick them up and light them up! Waiting for another set and an led hoop next! Thanks home of poi!" "DIY fire fan kit was really good, with everything provided even a special needle for threading the wicks properly. Instruction video was really easy to follow, along with wicks pre-cut to needed size, so dont need to worry about measuring and cutting straight etc as all done for you." "So so extremely satisfied with my Make Your Own Pair of Spider fans! Shipping took about 2 weeks but was the most exciting time waiting for something I ve been dying to receive! Great quality and weight to the fan- great for spinning and easy to grip! Thank you so much Home of Poi!"